The property was located near 2 different metro stops. We had enough space for all of us. It was close to the metro station. Staff were nice. Convenient access to metro. Quite, peaceful neighborhood. 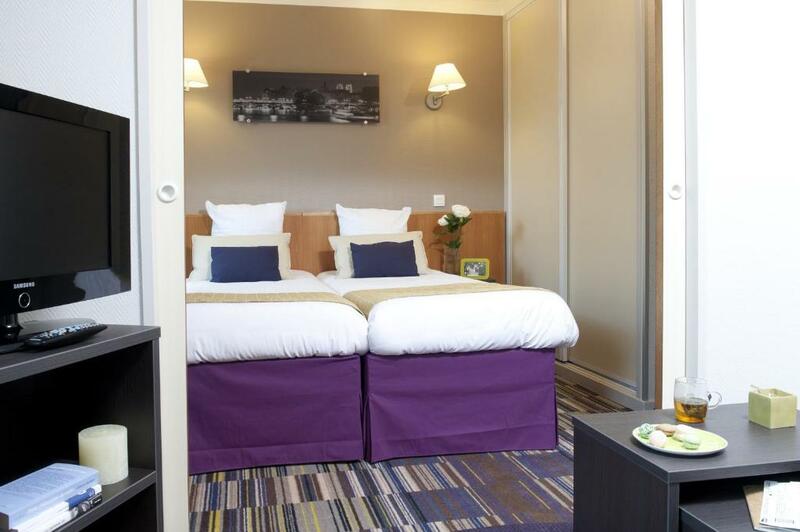 Close to Paris attractions, clean, quiet and cozy. Complete kitchen and if you prefer to prepare a meal the grocery store is just right by the corner 3 mins walk. There are restaurants close by as well. The neighborhood was quiet and convenient, plus it was close to two beautiful parks! Very clean, big apartment, kitchen installations (coffee maker, dish washer, fridge, spoons, plates...) very new. Stuff very friendly and cooperative. The hotel close to two metro stations (3 and 6 minutes walking). Very close from big supermarket (auchan) and bakery. In the hall u can find some games for adults and children offered for free. Really enjoyed my accommodation. The staff is very accommodating.. they want us to transfer to another room... The kitchen is clean 😊😘. And the space in living room is great.. 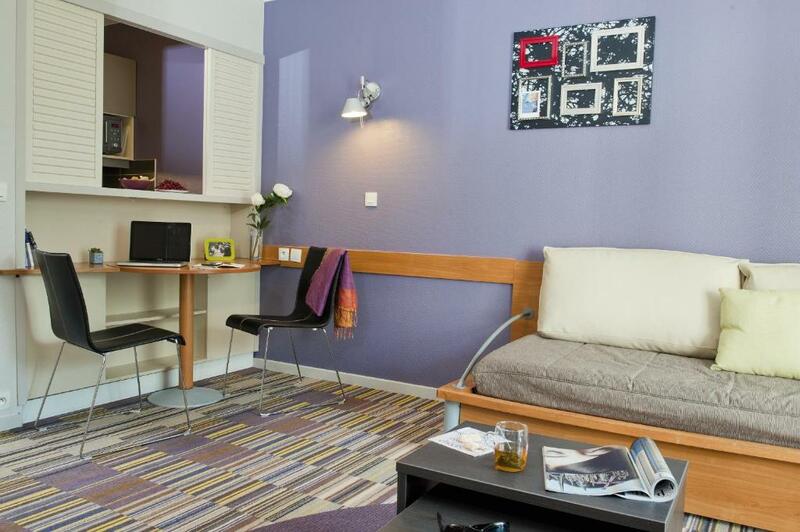 Lock in a great price for Aparthotel Adagio Paris Buttes Chaumont – rated 8 by recent guests! 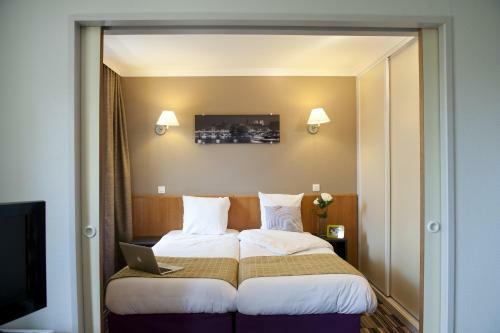 One of our top picks in Paris.Located opposite the Buttes Chaumont Park, this Aparthotel is a 20-minute walk from Paris’s Canal Saint-Martin. This eco-friendly property offers an outdoor garden and apartments with free WiFi and soundproofed rooms. Several apartments include a private balcony. Apartments have a living room with a satellite TV. Each kitchen is equipped with a microwave, fridge and dishwasher. 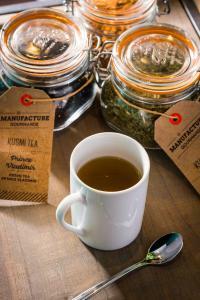 You can prepare your own homemade breakfast in your apartment. Or if you prefer you can enjoy a buffet breakfast, served each morning in the property's breakfast room for an extra charge. The property has a 24-hour reception. Additional features include cleaning services and a private parking at extra costs. The aparthotel is a 2-minute walk from Botzaris and Buttes Chaumont Metro stops providing access to Paris’ attractions and main transport connections. Guests can also go jogging in the Buttes Chaumont Park. 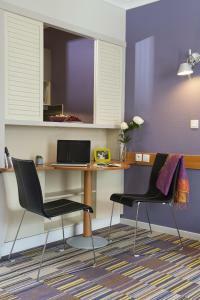 When would you like to stay at Aparthotel Adagio Paris Buttes Chaumont? This apartment has a living-room with a satellite TV and some of them include a balcony. The bedroom can be separated by a sliding door. The apartment comes with a fully equipped kitchen providing fridge-freezer, dishwasher, hob, microwave, kettle, and coffee maker. This spacious apartment has a balcony and a flat-screen TV. The bunk bed is not suitable for children under 6 years of age. These studios offer a flat-screen TV with satellite channels. Some of the studios have a balcony. This apartment includes a flat-screen TV with satellite channels. Some of them have a balcony. Aparthotel located in a pedestrianised street, in the heart of the atmospheric Parisienne neighbourhood. Area Info – This neighborhood is a great choice for travelers interested in tourist attractions, monuments and sightseeing – Check location Great location - show map Guests loved walking around the neighborhood! House Rules Aparthotel Adagio Paris Buttes Chaumont takes special requests – add in the next step! 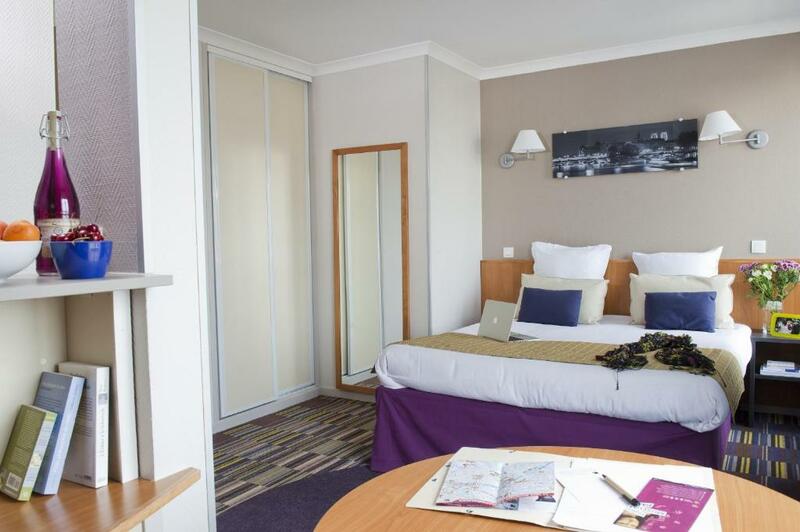 Aparthotel Adagio Paris Buttes Chaumont accepts these cards and reserves the right to temporarily hold an amount prior to arrival. Baby kits (cot & high chair) are subject to availability and available on request. Please note that private parking is subject to availability and is at an extra cost. a double bathroom for 6 persons is great. The kitchen is quite utilized, firm beds and good bedrooms. I didn't hear the snoring of our families. The subway is only 7 minutes walking. Very nice! There is not much I can add here. The place was cozy and comfortable and everything as described. Everything is in a reach, 2 metro stations are close, easy access from the highway. Lack of good restaurants nearby, but that's not dependent from the Hotel. Was a great pace to stay. We only stayed a few days, but was really good. Cozy and comfortable and close to metro stations and the highway. We traveled with a dog and there was no problem with that. I really have to take a moment to say just how happy I was with our stay. 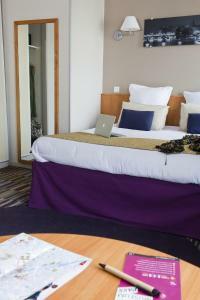 I stayed at the hotel with 4 other adult members of my family and we were all happy with the cleanliness of the rooms, the ample space, the lovely neighborhood, and the generous breakfast offer. Above all I'd really like to highlight the friendliness of the staff: every single person we spoke to was friendly and eager to help, and also was kind enough to put up with my less-than-perfect French! They even went so far as to help me print my boarding passes at the last minute, with no additional charge. I can't recommend this place enough. Merci beaucoup a tous! Love the apt it’s in a good location great customer service very highly recommend!! Everything in the room felt so dirty. The room is supposed to be for 4 person but the coach for 2 person was horrible, there was even no sheet for it and we had to sleep on this dirty coach. Toilette was the smallest that can ever be. The door to seperate 2 rooms were not closing. A lot of other things (plugs, door, coach etc) were also broken. The internet connection was very poor. Not crazy about the location. Difficult to find. What I don’t like is the parking, paid for the parking, being a guest that should be free but looks like anywhere you go in Paris there’s a charge. But at least u don’t have to worry where to park. Another thing with the parking, to get to their parking you have to borrow the remote for the garage to open, it is inconvenient that a guest need to walk to the reception to get and return the remote. The reception should have the access to open it or add a keypad to their garage that only guests can open. Clean, ok breakfast, good value.